Witty Pi Mini is the new member of Witty Pi family. It has the same functionality of Witty Pi 2, and it has pHAT shape (same dimension with Raspberry Pi Zero), which is perfect for Raspberry Pi Zero (and other models). 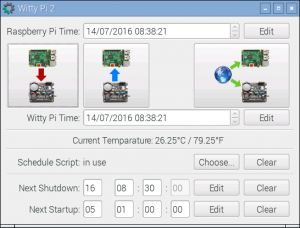 Witty Pi Mini adds RTC and power management to your Raspberry Pi, and can define complex ON/OFF sequence with simple script. Same as Witty Pi 2, Witty Pi Mini uses a very accurate RTC chip (DS3231SN), which only has <160 seconds error per year. Also this RTC chip has temperature sensor built-in, so you can read the temperature around your Raspberry Pi via the software. Witty Pi Mini uses a super capacitor (0.08F, or 80,000uF) for RTC off-power time keeping, and it can remember the time for ~17 hours without any external power supply. The “dummy load” feature is still available and you can turn it on/off via a small switch on board. It is very useful when you use power bank as power supply, as it will draw peak current with certain interval, and keep your power bank alive. Witty Pi Mini supports all Raspberry Pi models with 40-pin header, including A+, B+, 2B, Zero, Zero W, 3B, 3B+ and 3A+. Witty Pi Mini uses the same software with Witty Pi 2. The software is written with Bash (Unix shell), and there is also a GUI application available (requires QT 5). After the installation is done, turn off your Raspberry Pi, then physically mount Witty Pi Mini on it. Connect 5V DC power supply to the micro USB port on Witty Pi Mini, and tap the button to start.